Cipollino Bianco marble is the star of this space. The marble’s varied natural coloring and unique veining is accentuated in this herringbone application. 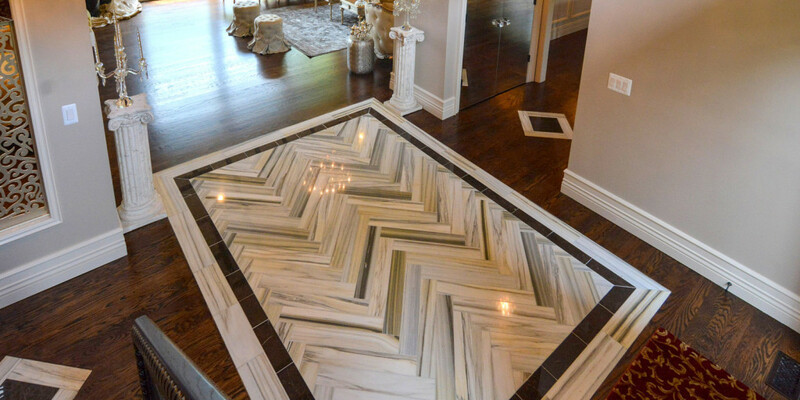 The bold use of the marble opens up the foyer and creates a glamorous yet welcoming feel for everyone who enters. The Herringbone theme continues down the hallway with the Cipollino marble hugging a square piece of coffee brown marble in uniform repitition drawing the eye to the custom butlers pantry at the end of the hall. 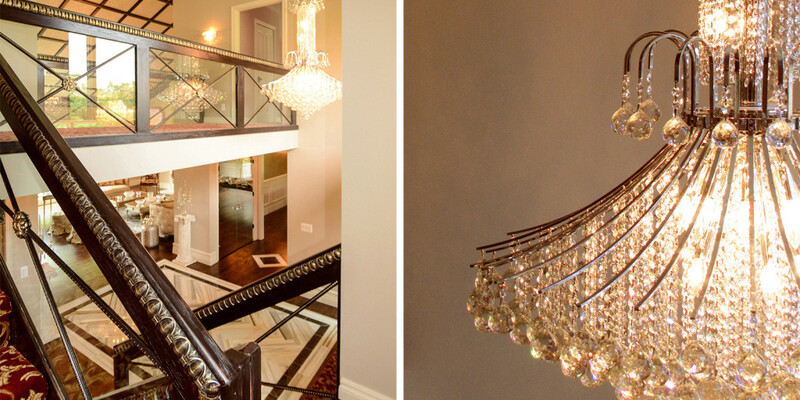 The mini crystal chandeliers repeating down the hallway harmoniously mimic the flooring, further emphasizing its beauty. 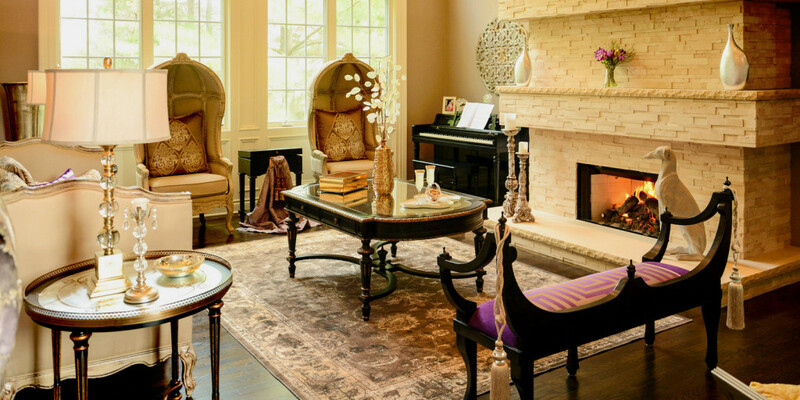 There was a perfect solution for this homeowner who loved sophistication and elegance but also entertained constantly and was interested in creating a dynamic atmosphere when needed. The answer was backlit white onyx tiles placed in panels flanking the great room fireplace. Backlit using LED lighting, these panels can pulsate vibrant colors giving an energetic feel to the room or can emit a calm warm white light adding to the sophistication and elegance of the room. The ambience and feel of the room is transformed by the touch of a switch. After completing a full home renovation, the homeowners didn’t have much left in the budget to redo the dated honey oak square profile railing with plain glass panels. Rather than tear out the existing stair system, it was given a facelift. Decorative egg and dart moldings were added to bulk up the grip of the railing and add some traditional detailing. The continuous expanse of glass was divided to give the look of custom panels using an X-design that was crowned with a decorative rosette at each juncture. The existing honey stain finish was stripped in favor of deeper, richer chocolate wood tones. 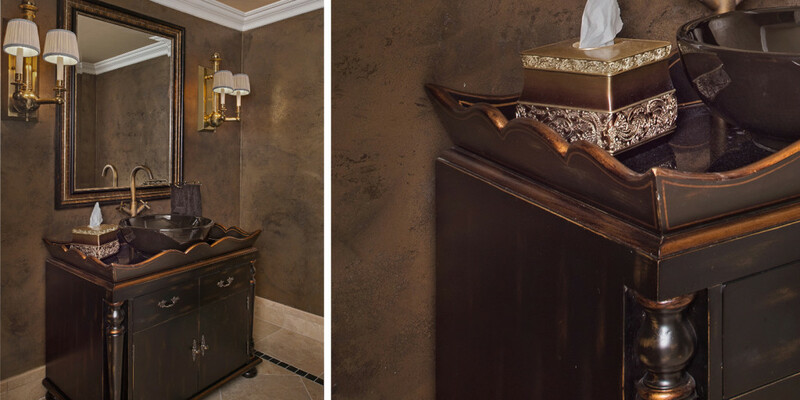 As a finishing touch, some gold metallic highlights were added to accentuate the detail of the wood moldings added. 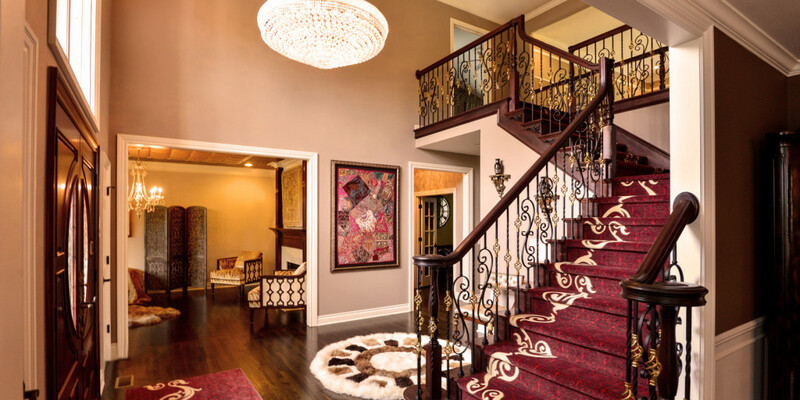 The transformation resulted in a sophisticated custom stair look for a fraction of the cost. This family room features traditional leather tufted sofas perfectly sized to work with the tight constraints of the room. 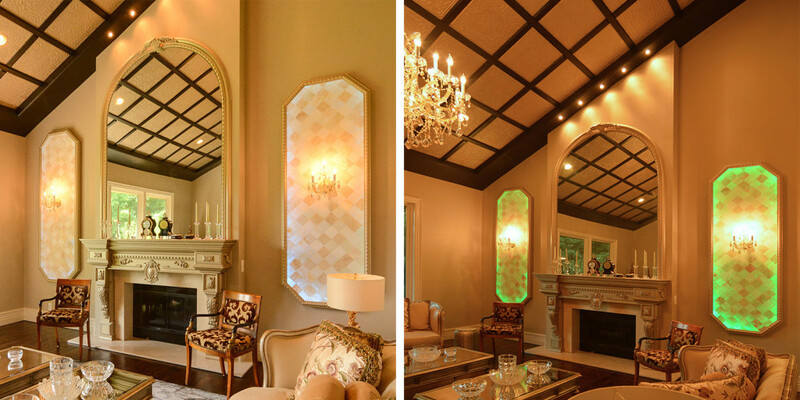 The innovative ceiling pattern was created using square mirrors the homeowner found at a flea market. 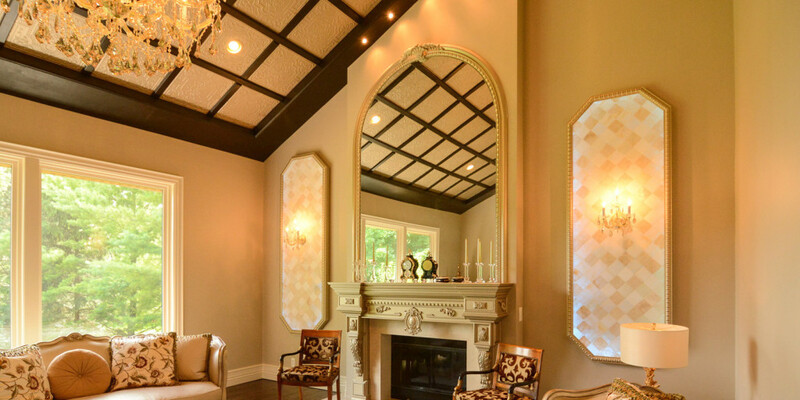 Trim work was added to create a geometric ceiling pattern in rich wood tones. 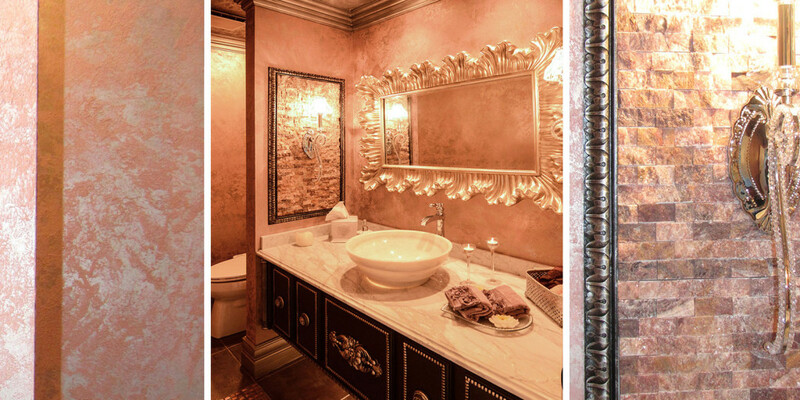 The metallic Venetian plaster walls also add to the spacious feel of the room and bounce light throughout. 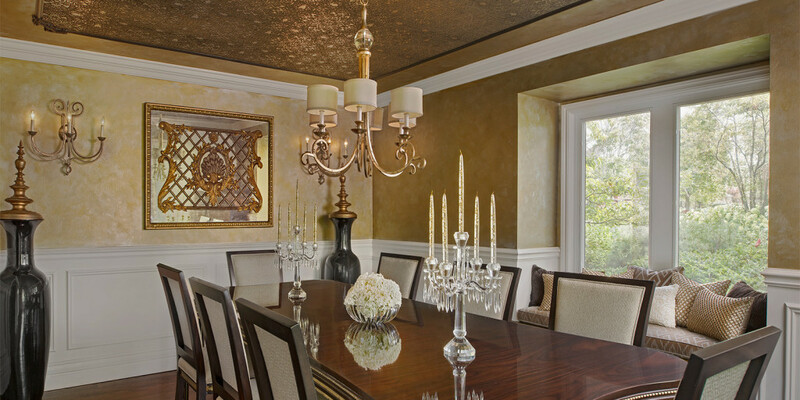 A harmonious mix of wallcovering, finishes, and textiles were utilized in this dining room. The decision was made to keep the dining room chairs simple in understated elegance to allow the table to shine. 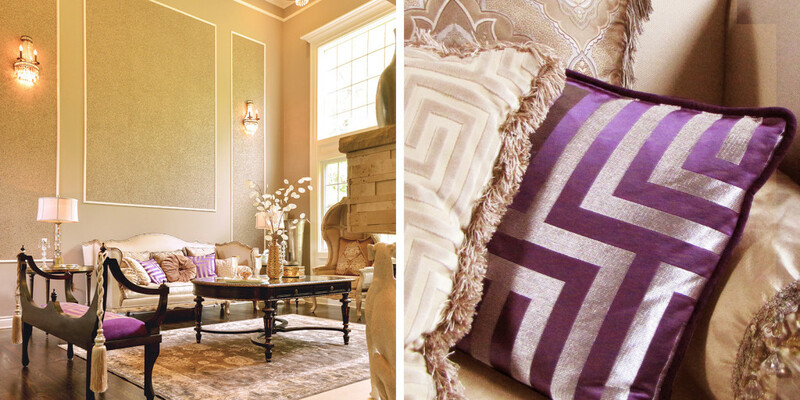 Texture and pattern were intermixed in other aspects of the room. The jumping off point was the wallpaper selected for the ceiling in a large scale raised velvet flock giving the ceiling a dimensional effect. The same theme was carried through in selecting the fabrics for the bench seat cushion and pillows; the layering of richly textured textiles and patterned velvets completes the additional seating in style. 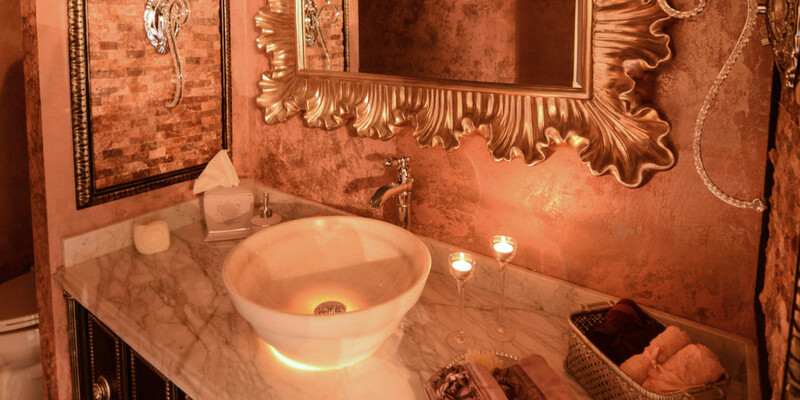 The design of this powder room revolved around the split faced pink onyx mosaics the homeowner fell in love with. The beauty of this natural stone is prominently displayed in two panels flanking the custom cabinet and white onyx vessel sink lit from below. The space is bathed in warm pink tones-from the textured paint on the walls to the iridescent mosaic accent tiles in the floor. 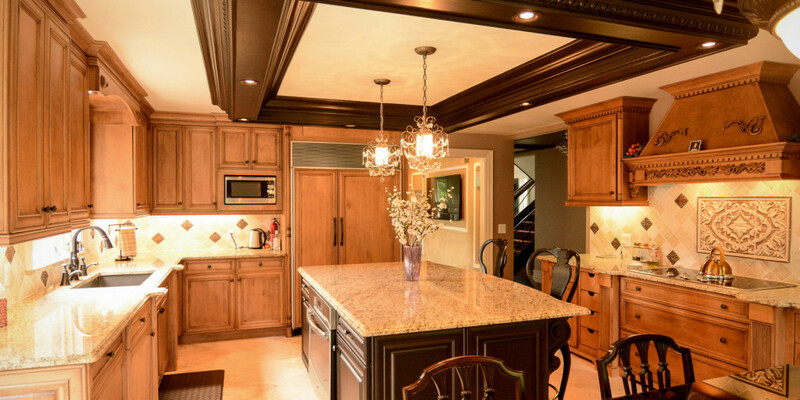 The chocolate stained custom cabinet with silver metallic accents provides a lovely contrast and echoes the sparkle from the crystal sconces, the metallic flooring, and textured silver ceiling above. From a dated, dreary grey look to a bright, warm and all around inviting atmosphere, this kitchen underwent a major overhaul. 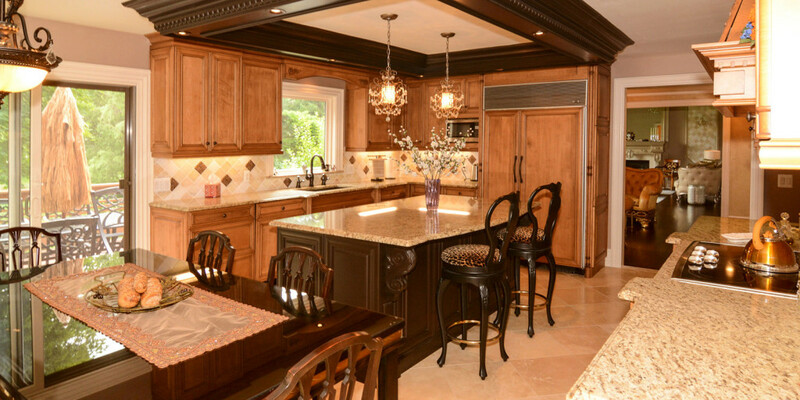 This two tone kitchen has some major drama with a dark chocolate island and soffit contrasting the surrounding warm honey cabinets. Relocating the range from the center island to the far wall really opened up the space and gave it the feel of a much larger kitchen. 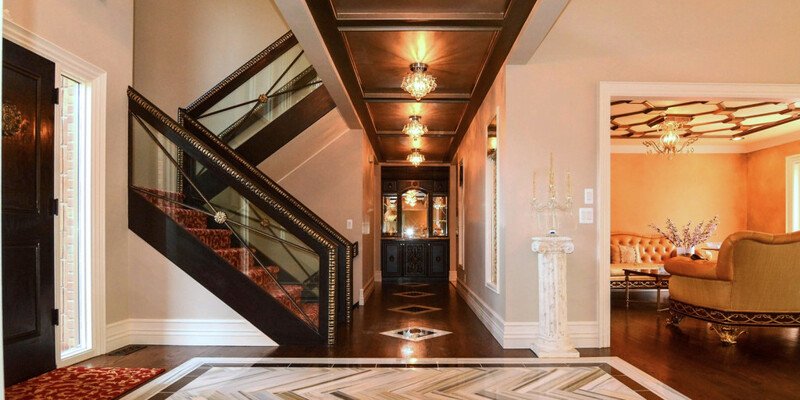 Attention to detail is evident throughout- from the travertine floors with glass insets and the white onyx backsplash to the soffit’s egg and dart detailing and sparkling crystal chandeliers. Gracious and inviting the resulting space evokes images of understated elegance and sophistication. “Bath with a Silver Lining” Space restrictions turned out to be a blessing in disguise for this basement bathroom. 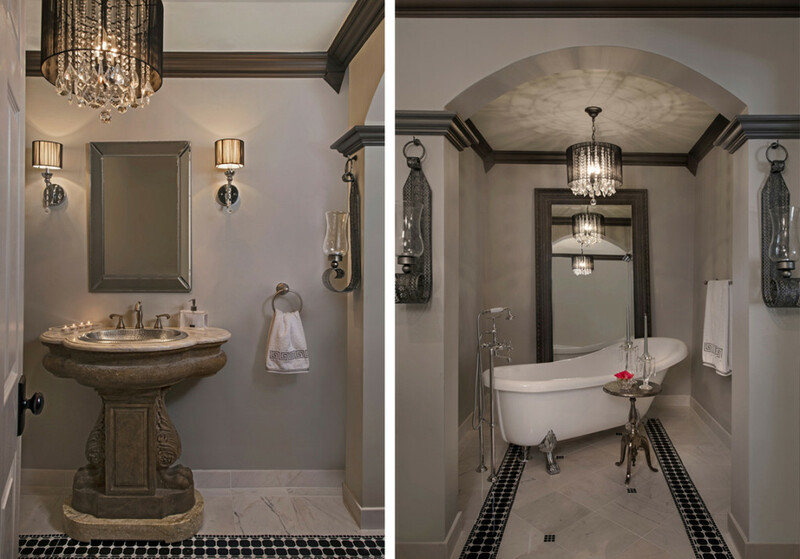 With a long and narrow space, the challenge was designing the bathroom while avoiding a tunnel-like feel. The proposed solution was using an arch and columns to break up the space and create a museum-like framework to display the sensuous claw footed tub. The use of two shaded crystal chandeliers evokes a moodiness in the space through the play of light and shadows, an effect that is multiplied with the placement of a mirror. Utilizing the large dark-framed leaning mirror behind the tub serves as a visual extension of the intricate flooring pattern bringing the eye up towards the star of the space-the tub. This foyer was in desperate need of attention. The honey oak railing, spec carpet, and dated wood balusters had to go. 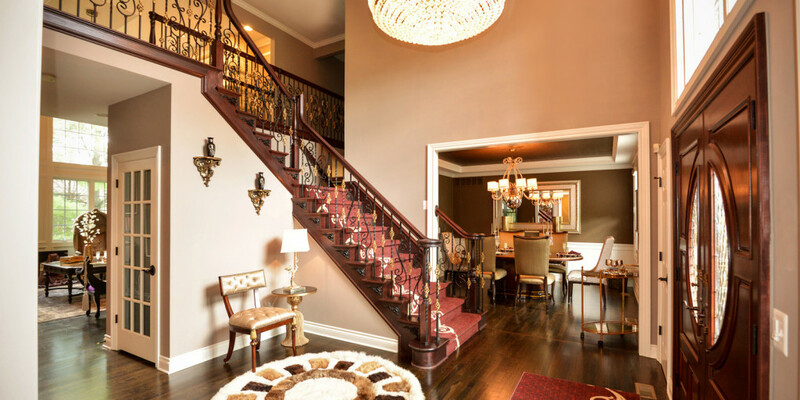 An over the post railing and iron balusters with gold accents are used to update the stairs. The plain white stair carpet is swapped for wood treads and a rich deep red stair carpet. Taking its cue from the intricate scroll railing, the carpet also incorporates the scroll motif. This asymmetrical scroll delicately undulates down the left side of the staircase infusing an otherwise traditional foyer with a modern twist. Prominently displayed to the left of the staircase is the homeowner’s handmade embroidered artwork with intricate beading. Framing the art piece and displaying it where it is immediately visible upon entry, not only respected the sentimental value this piece carried but also balanced the distribution of color in the space. 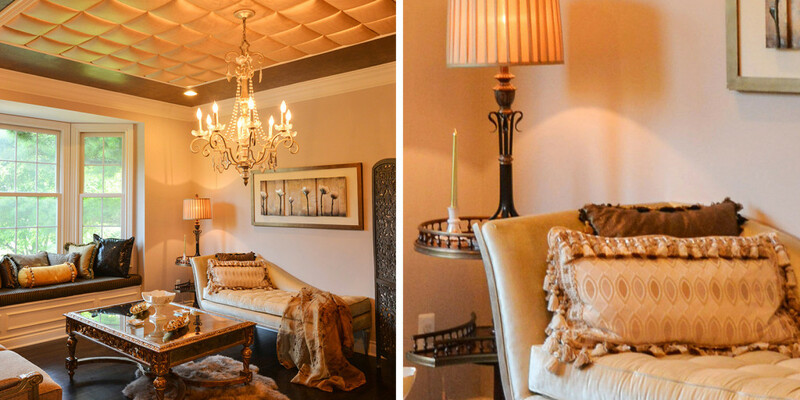 The grand 3-tiered crystal chandelier illuminates the space and provides a warm glow throughout. This living room was transformed from a bland, modest space into a dramatic space that is anything but. Rather than overlooking the ceiling as a design element, golden upholstered squares were used to transform the ceiling into a focal point. The color palette was tied together using a mix of luxurious fabrics on the bench seat and furniture. Flanking the fireplace, crystal sconces are mounted on mirrors that accentuate and bounce light reflections in the room. 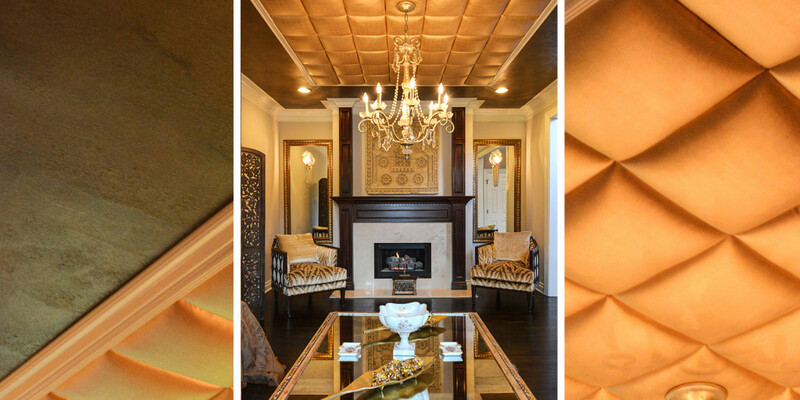 The tones of the golden ceiling are reflected in the luxurious fabrics on the bench seat and furniture. 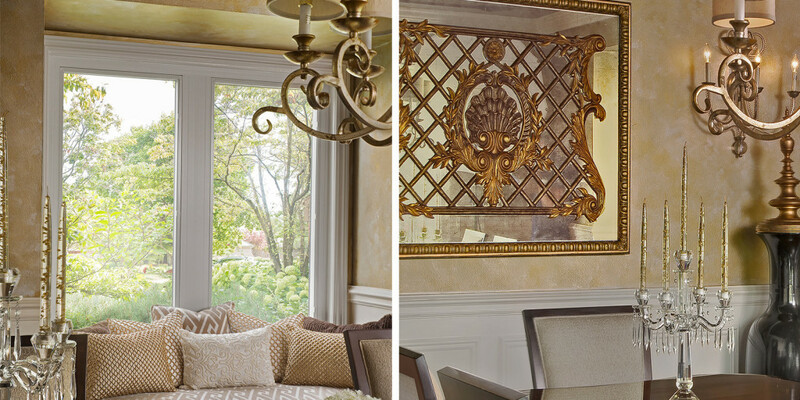 Deep wood tones enrich the space while gold accents are interspersed resulting in a cohesive yet glamorous interior. The transformation from an all-white, trimless space with dated oak floors to a striking space with bold colors is quite drastic. 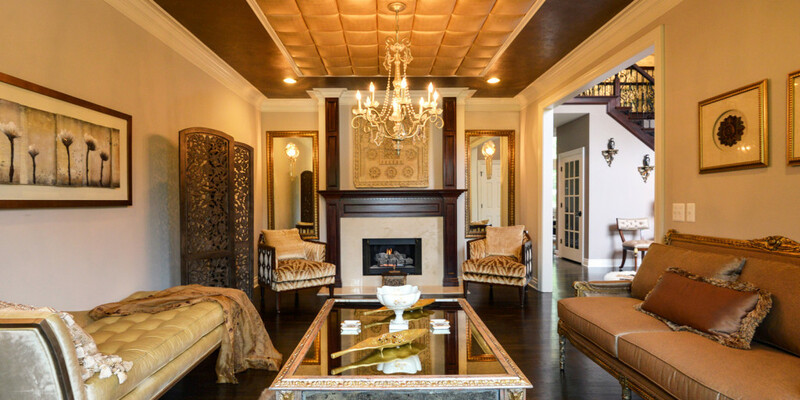 An antique bronze metallic paint highlights the patterned ceiling tile while closely coordinating with the wall color. The spectacular oval dining table boasting a carved molten metal medallion at its center is complimented by four silk chairs and two contrasting host and hostess chairs with tufted backs and crystal buttons. A carved console table in a gilt finish and an antique mirror top was placed beneath a mirror in a similar finish. 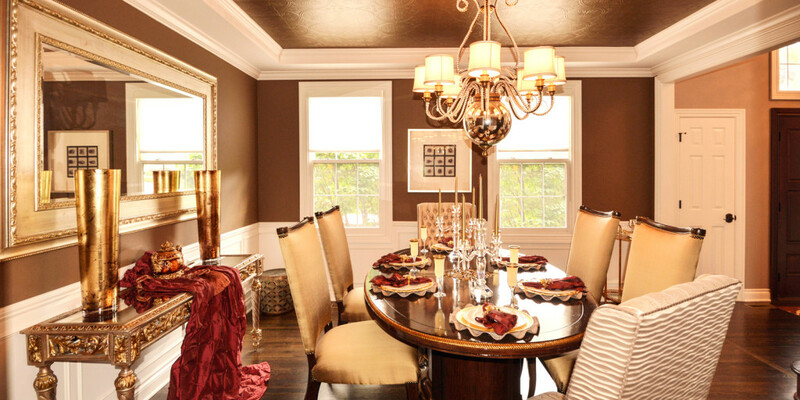 Wine red accents and a large shaded chandelier with crystal accents enhance the glamor of the room. This interior mixes the freshness of modern lines and elements with the classic beauty of traditional furnishings and textures. 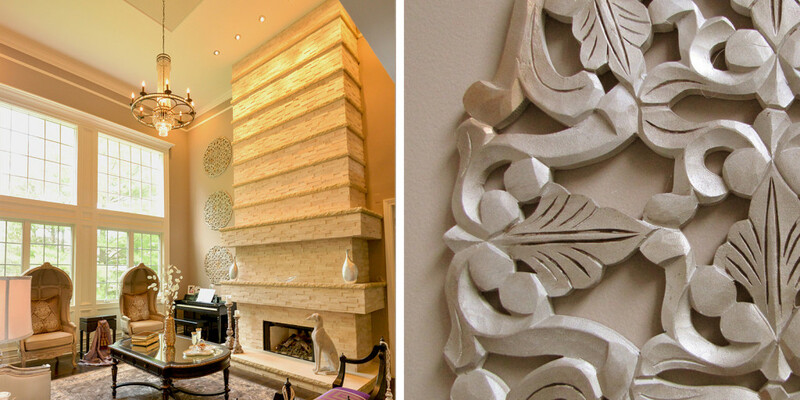 Emphasizing the height of the room is a travertine fireplace interspersed with limestone ledges. Adding glamor and sparkle to the room is wallpaper inset in panels proportioned to play off the sofa perfectly. The juxtaposition of the wallpaper to a similar paint color provides a play on textures that is understated yet glamorous. 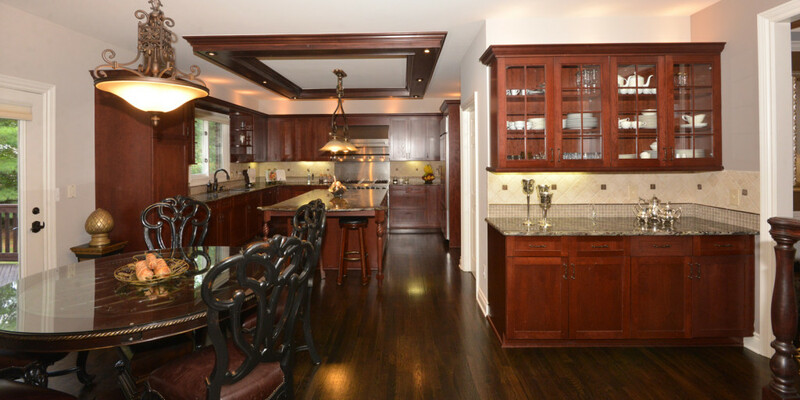 Although budget restrictions dictated keeping the existing cherry cabinets, this kitchen was given a major update. The backsplash and the granite in the kitchen were changed. The center island received a 30% enlargement in size by extending the granite out and providing support on decorative posts. This served as an overhang and provided seating for two counterstools. The random lights in the ceiling were organized in a dropped wood soffit highlighting the rich veining of the granite below . Molding was added to the top and bottom of the cabinets to hide the newly installed overhead and undercounter lighting. A tall pantry cabinet was ordered to extend the kitchen out and provide the necessary framing. 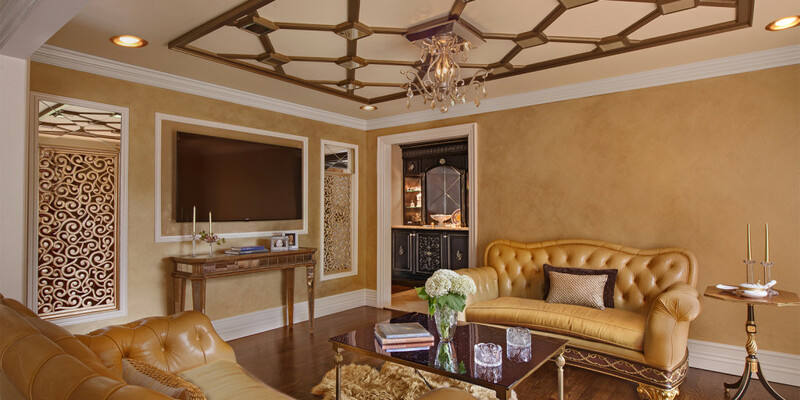 This family room features traditional leather tufted sofas and gold walls that offset the dark stained trim in the ceiling above. An exotic lamp vase provides accent lighting, and a mirrored wall clock accentuates the room. 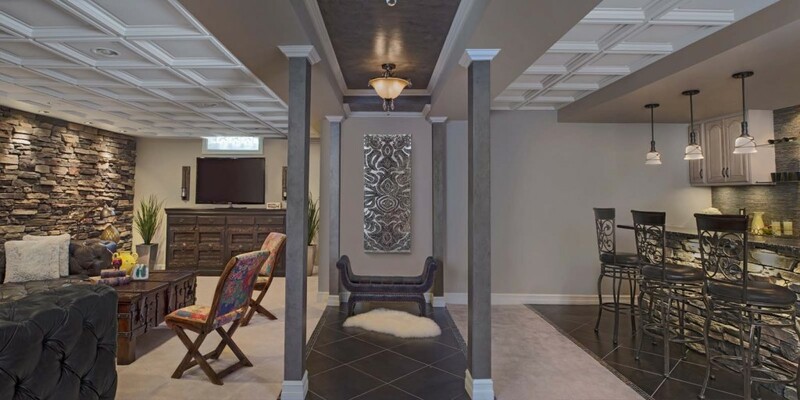 The goal for this basement was to create a retreats basement was to create a retreat away from the formal interior of the main floor; to create a masculine space for the homeowner to entertain, relax, and unwind. Formerly a monotonous space with a low ceiling and a continuous sea of bland ceiling tiles, the new design used the ceiling as a strategic design tool to delineate different zones. The ceiling grid was reused and installed at different elevations. Variations in ceiling height were incorporated to create a visual separation between the various zones and break up the large expanse of ceiling tiles that existed before. Islands of drywall were interjected strategically covering ducts and piping, allowing the ceiling to be raised in other areas. Being a windowless basement, the layering of materials and the use of stone helped bring the outside in and added a warm inviting feel to the space. 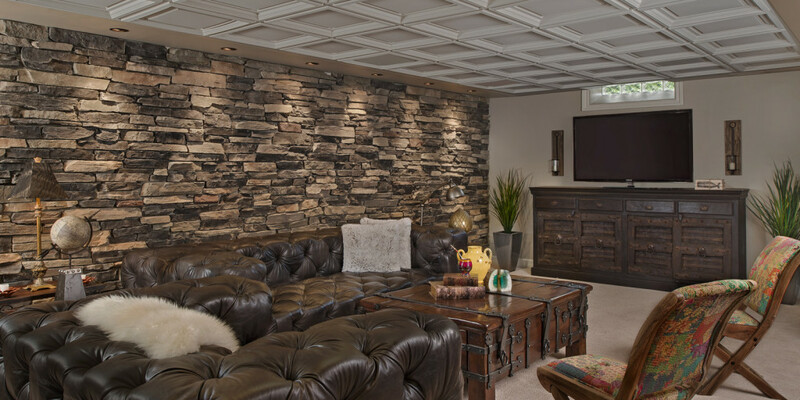 In the seating area, the accent stone wall takes center stage, adding nuances of texture, pattern and color to the space. The goal f for this basement was to create a retreats basement was to create a retreat away from the formal interior of the main floor; to create a masculine space for the homeowner to entertain, relax, and unwind. Formerly a monotonous space with a low ceiling and a continuous sea of bland ceiling tiles, the new design used the ceiling as a strategic design tool to delineate different zones. The ceiling grid was reused and installed at different elevations. Variations in ceiling height were incorporated to create a visual separation between the various zones and break up the large expanse of ceiling tiles that existed before. Islands of drywall were interjected strategically covering ducts and piping, allowing the ceiling to be raised in other areas. Being a windowless basement, the layering of materials and the use of stone helped bring the outside in and added a warm inviting feel to the space. In the seating area, the accent stone wall takes center stage, adding nuances of texture, pattern and color to the space. In the bar area, the existing cabinets were preserved to lessen the impact on natural resources. The existing finish was stripped and a new coat of paint and glaze were applied breathing new life into otherwise dated cabinetry. Rather than tear out the wall supporting the bar, it was retained and covered with sustainable ledger stone adding texture and nuances of color variation to the space. 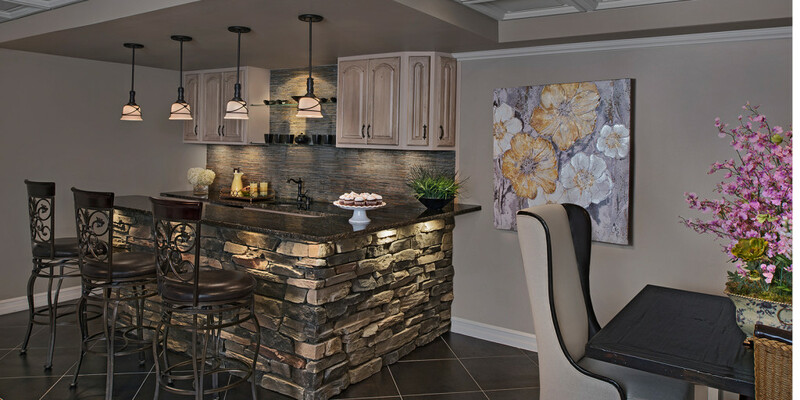 The rugged backsplash emulates the feel of the ledger stone as does the rock faced edge of the countertops. Juxtaposing the roughness of the ledger stone with the smoothness of the metallic tile flooring adds an unexpected layer of contrast. 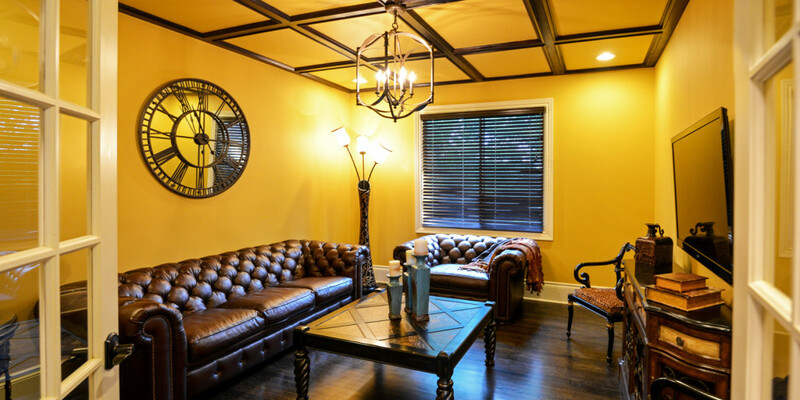 The original ceiling grid was preserved and reused and the original ceiling tiles were diverted to a local project in need of construction material donations. This powder room not only had a dated look but also had a layout issue. The layout was reconfigured to allow the vanity to take command attention in the space. 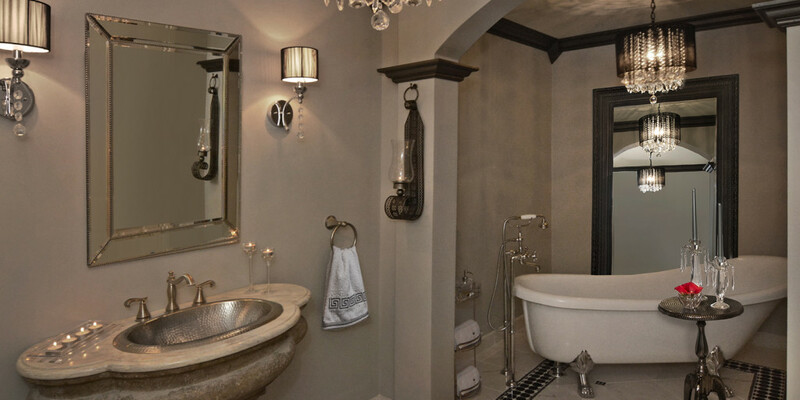 The toilet was relocated to the adjacent wall, the newly centered vanity was flanked by shaded sconces adding to the romantic moodiness of this powder room. Dark metallic faux finished walls complete the space.